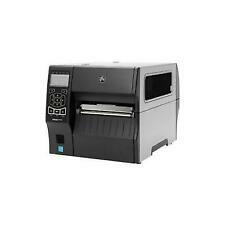 Zebra GK420d Thermal Label Printer - USB / Serial - Royal Mail Recommended. Condition is Seller refurbished. Dispatched with eBay delivery – Shutl 1 day. This is in GOOD CONDITION. Removed from a working environment. *USB lead *Power adapter and power cable *In original box *Driver CD Only ship within UK Paypal ONLY Please feel free to ask any questions. 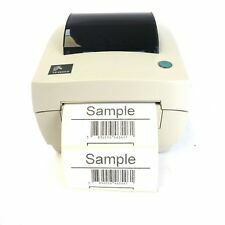 Zebra TLP 2824-Z USB Thermal Label Printer + approx. 2500, labels. Zebra tlp 2824-Z thermal direct/transfer. zebra designer software and drivers. 25mm x 50mm vinyl labels. you will receive one in similar condition to the printers pictured. Include a roll of labels, 300 4x6. The GX430t has a sleek and compact design, boasts the easiest ribbon loading system on the market, and supports a variety of applications and industries. Condition is Manufacturer refurbished. SEE PICTURES FOR CONDITION INCLUDES ALL WIRES AND THERMAL CLEANING PEN. 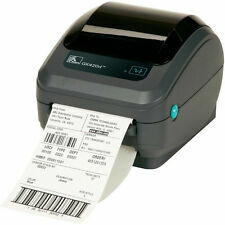 This is a Zebra ZP 450 thermal label printer with integrated power supply. No ink required, just thermal labels. Good for printing shipping labels. Excellent condition, comes complete with power cable and USB cable. Thank you for looking, please do take a look at my other items. 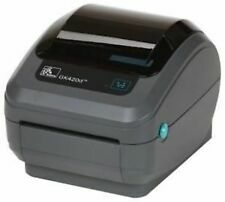 Zebra GK420d Direct Thermal Label Printer - GK42-202521-000 USB/Serial/Parallel With Peeler Option. It is a direct thermal unit so doesn't need a ribbon. The Zebra LP2844 direct thermal bar code printer leads the way in versatile and affordable desktop printing-- The direct thermal Zebra LP2844 bar code printer brings new levels of performance to the Zebra desktop family. 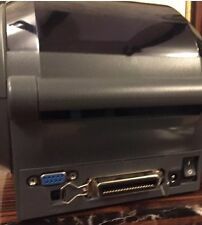 Zebra Swecoin TTP8200 A4 Thermal Receipt Printer. Tested and in excellent working used condition. The Printer Broker Ltd is a supplier of printers, fusers and printer parts based in Bolton, Greater Manchester, UK. Part : LP2844-Z. 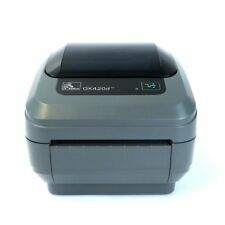 ZEBRA GK420d THERMAL LABEL PRINTER. PART # GK420d. ZEBRA THERMAL LABEL PRINTER. USB / SERIAL INTERFACE. USB CABLE INCLUDED. DRIVERS INCLUDED. See all pictures test prints included to prove head condition. 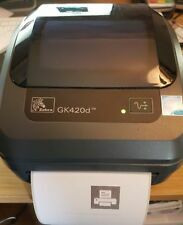 Zebra GK420d USB Label Printer. 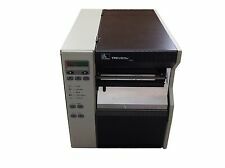 Up for sale is one of my Zebra GK Label Printers. Along with labels on a roll, this particular version can be used to print continuous Fan labels (or z labels) like concert tickets etc which are fed through the back of it and then it prints them out the front as normal. Zebra TLP2824 Thermal Transfer & Direct Thermal Label Printer - 2824-11100-0001 USB & Serial. These units may have light UV discolouration, functionality is entirely unaffected. To print from any PC connected to the network requires ZebraNet Bridge software. In good working order, good print quality. Zebra Fedex ZP 505 EPL Direct Thermal Label Printer. Used but in great condition. Powers on and tested by printing a label. No cables supplied with the printer. Dispatched with eBay delivery – Shutl 1 day. This unit can be used in Direct thermal or Thermal Transfer mode. This is what Zebra has to say: -. Supplied with power lead & 6 months RTB warranty. • Hospitality/Transportation ticketing. USB & Serial DB9 Connections. Print up to 5" Per Second. We will always go out of our way to source the product you are looking for. Add to Favourites. 4MB Flash RAM and 8MB SDRAM. We Have For Sale: one. This is for a Zebra thermal label printer. Direct Thermal Printing only (NOT THERMAL TRANSFER). Parallel & Serial connections. We will always go out of our way to source the product you are looking for. Add to Favourites. USB, Serial DB9 & Wifi Connections. Print up to 4" Per Second. We will always go out of our way to source the product you are looking for. Add to Favourites. 4MB Flash RAM and 8MB SDRAM. Direct Thermal Printing only (NOT THERMAL TRANSFER). USB & Serial connections. We will always go out of our way to source the product you are looking for. Add to Favourites. We have had this setup and printing on a Windows 10 system, software can be downloaded from the Zebra website, one of the pictures show the Zebra Designer 2 software running. Zebra label printer, model LP2844-Z. We make buying online as simple as it can be.